NEW DELHI, INDIA—Design Matrix recently deployed Martin by HARMAN RUSH UV lighting fixtures in the ‘WYSIATI’ art installation to create unforgettable lighting effects. ‘WYSIATI (What You See Is All There Is). Or is it?’ is an art installation created by Harmeet Singh Issar and Sanjeev Nangia as part of iGuzzini’s ‘Light First’ exhibit. ‘WYSIATI’ takes different forms depending on where you stand, stimulating people to stop, reflect and take a new perspective. In order to achieve this effect, Issar and Nangia hired India’s leading architectural lighting experts, Design Matrix. After consulting with the creators, Design Matrix selected Martin by HARMAN RUSH PAR 4 UV and RUSH BATTEN 1 HEX fixtures for their high-output ultra-bright UV light. 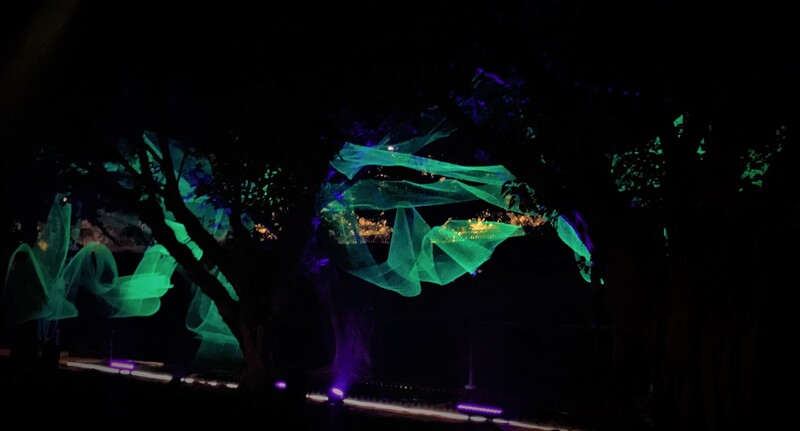 ‘WYSIATI’ is constructed using fluorescent pigment, wire mesh, and high-gloss mirror sheets strung across the tree-lined boulevard. RUSH PAR 4 UV fixtures illuminate the wire sculpture with an ultra-bright UV LED light, morphing the texture of each surface as viewers move around the exhibit. RUSH BATTEN 1 HEX fixtures provide controllable electronic dimming, strobe, and pulse effects, allowing the designers to achieve a variety of exciting looks. The RUSH PAR 4 UV is a bright single-lens UV LED PAR can light fixture for use in blacklight applications. The fixture includes a 100-watt COB 400 nm UV LED mounted in a reflector for high-output ultraviolet light, and has regulated air cooling for quiet operation. With electronic dimming and strobe and a bracket suitable for floor or truss mounting, the RUSH PAR 4 UV is ideal for a variety of nightlife, stage, and concert applications. The RUSH BATTEN 1 HEX is an ultra-bright 12-cell batten color + UV wash fixture with full pixel control. Featuring 12 watt RGBAW+UV 6-in-1 LEDs, the RUSH BATTEN 1 HEX provides intense light for color, white, or blacklight applications. Equipped with pixel mapping and controllable electronic dimming, strobe, and pulse effects, designers can achieve a variety of exciting looks. A removable diffuser/lens increases the beam angle from 25° to 32°, and brackets are available for floor or truss mounting. The LED source and rugged, lightweight construction make it ideal for live shows, TV events, stage, concerts, and nightclubs. HARMAN (harman.com) designs and engineers connected products and solutions for automakers, consumers, and enterprises worldwide, including connected car systems, audio and visual products, enterprise automation solutions; and services supporting the Internet of Things. With leading brands including AKG®, Harman Kardon®, Infinity®, JBL®, Lexicon®, Mark Levinson® and Revel®, HARMAN is admired by audiophiles, musicians and the entertainment venues where they perform around the world. More than 50 million automobiles on the road today are equipped with HARMAN audio and connected car systems. Our software services power billions of mobile devices and systems that are connected, integrated and secure across all platforms, from work and home to car and mobile. HARMAN has a workforce of approximately 30,000 people across the Americas, Europe, and Asia. In 2017, HARMAN became a wholly-owned subsidiary of Samsung Electronics Co., Ltd.